Do I think he said it? Probably not. But you know what? Sometimes what could have been is worth more than what is. He did however write a very nice open letter to JKR thanking her for HP, which EMPIRE published, IIRC. Even if he didn't say it, I believe he may have thought it for a second or two. Wow. I never realized you were a Rickmaniac! 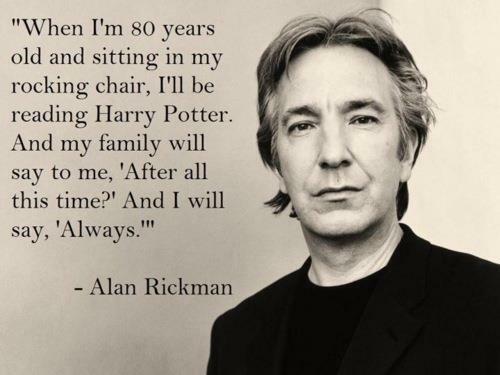 >I postulate one must be at least somewhat, and possibly entirely, dead, to not love Alan Rickman. Here, we are as one. I am totally in love with the voice. Of course you are. It's how God sounds. Or just the Metatron, anyway. No... I think if one first saw him in Robin Hood: Prince of Thieves and remembers quite CLEARLY the Spoon scene, one really doesn't get the Warm and Fuzzies from Alan Rickman. I don't think I've ever seen a picture of _Alan Rickman_ before. I'll watch any film he's in, but I don't know whether I would have recognised him. *laughs* "That guy! I love that guy!" "Who is he?" "He's THAT GUY!"